On this week’s #FamilyFriday article, ERA Law Group, LLC wants to discuss some recent changes in Maryland Law that will become effective October 1, 2018 including getting a quick divorce with minor children and what happens when you owe child support! 1. Divorce by Mutual Consent expanded! 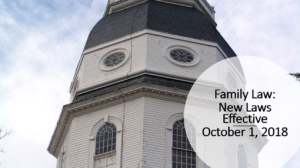 As some may know, effective October 1, 2016, Maryland Law permitted couples to divorce without waiting the formerly required one-year if they settled all marital issues and did not have any minor children. Now, Maryland has permitted this type of divorce – by Mutual Consent – to occur for couples with minor children. The couple still must resolve all marital issues such as alimony, marital property, debt, etc. and also must resolve all issues concerning the children including child support, physical custody and legal custody. Additionally, mutual consent no longer requires both parties to be present for the divorce hearing. Only 1 party needs to be present. Now, more than ever, Courts are going to want to see detailed and thorough separation agreements which completely capture the settlement arrangement between parties. Additionally, parenting plans – plans that focus on the upbringing of children in a divided household – will be a useful tool in ensuring that the matters concerning the minor children truly are and remain settled. 2. Failure to Pay Child Support! When an individual fails to pay child support one of the immediate consequences is the revocation of their license. While this is a significant consequence, it often creates more harm than good. Without a license, the obligated person can’t get to work. If that person can’t get to work, they can’t pay child support. If they can’t pay child support, they become further in arrears. The cycle continues. Effective October 1, 2018, a person who has suffered the above consequence and has successfully enrolled in an employment program with the Child Support Administration can have their license reinstated and can, upon referral from CSA, have their driving record expunged of the suspension. This new law encourages those parents who are in arrears to enroll in programs which will assist in the improvement of their employment and thus, pay their child support. 3. You can orally modify your grounds for divorce! In most contested divorce cases, couples have various reasons they are seeking a divorce. That could mean adultery, cruelty of treatment, desertion, etc. When filing for divorce the filing party must select the grounds for their impending divorce. If, after a period of months and negotiation, they later decide to settle their issues and wish to proceed on an uncontested ground such as a 12-month separation, they would need to formally file an amended complaint. Unless represented by an experienced attorney who catches the need to file an amended complaint, this often creates unnecessary delay. Effective October 1, 2018, parties do not need to file the amended complaint and can orally modify their complaint in open court at their final hearing and state that they wish to proceed on a 12-month separation. This is especially useful for couples who may not settle until just days or hours before the final hearing and/or couples not represented by an attorney. It allows couples to proceed with their divorce without having to prove the original grounds in which they filed.